The other day I was at Costco, and came across this HUGE package of Play-Doh containers. There were 80 of these little containers in the pack for $11 (Canadian)! I snatched them up because not only are they great Halloween "treats", they're also perfect for birthday party favors etc etc since they're only about 15 cents each!! 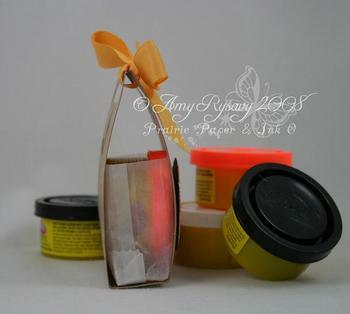 When I got them home I sat down and fiddled around with a few of my Papertrey packaging items to try and come up with a cute (yet quick and inexpensive) way to package up these containers - and came up with this Mini Treat Bag. Read on to find out how to make them! I cut the bag so that it was about 2.5" high. 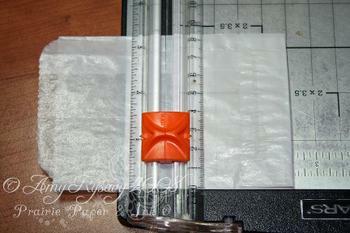 Using my Scor-pal I scored the sides and bottom of the bag - 1/2" from each edge. It helps if after you score you fold the score lines back and forth a couple of times with these types of bags - it makes the next step easier. 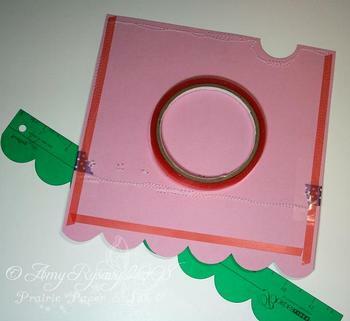 Open the bag and shape it on the fold lines - there will be two little triangle tabs on the bottom - fold them under and adhere them in place with mini glue dots. Then set the bag aside. Next take a piece of cardstock (here I used PTI's Kraft CS) cut to 2.5" x 8.5" and score it twice - 3.75" in from each edge. After that I used my Stampin' Up! Word Window Punch to punch "handles" in each end. To decorate my treat bag I stamped the web from Spooky Sweets II set in white pigment ink, and the bat from the Spooky Sweets set with black ink. 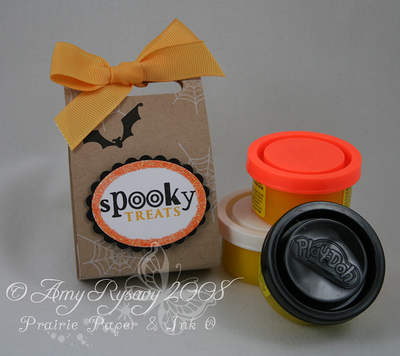 I created a fun little label for the bag using the Spooky Sweets set, oval nestabilities dies, black and Summer Sunrise ink, and orange glitter. 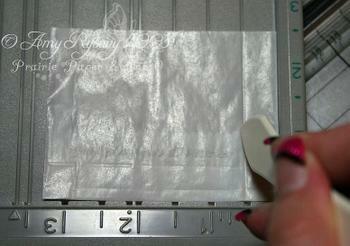 To adhere the glassine bag to the cardstock "cover" - use 2 strips of strong adhesive (I use Red liner tape) cut 5" long. After peeling off the liner adhere the bottom of the glassine bag first then fold up the sides so that they adhere to the bag as well. Here's a side view of the finished bag. I adhered the label with dimensionals and tied on some Summer Sunrise Grosgrain ribbon. And here's the final bag again. These are SO quick and easy to make, and the great thing is you can easily change up the colors and stamp sets and make these bags for Birthday Party/Baby Shower/Wedding Favors etc etc!! 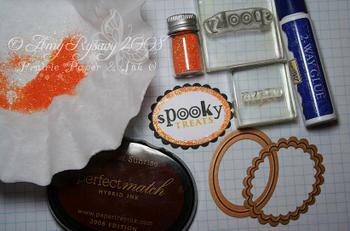 STAMPS: Spooky Sweets, Spooky Sweets II. CS: Papertrey Select White and Kraft, Black (SU!). INK: PTI Summer Sunrise, Black Ink, White Pigment Ink. ACCESSORIES: PTI Medium Glassine Bags, SU! 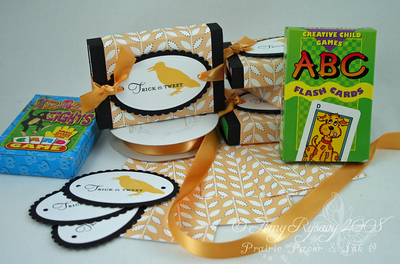 Word Window Punch, Summer Sunrise Grosgrain Ribbon, DoodleBug Glitter, Oval Nestabilities dies, dimensionals. Can you believe it's September 1st already?? Time is just flying by!! 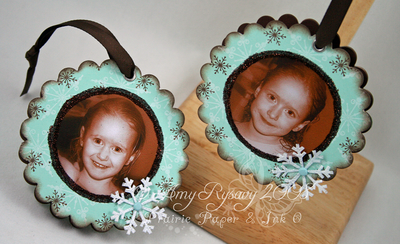 I made ornaments using 4" lightweight round coasters (cut with a scalloped circle nestability die) and added pictures of the girls. There's a lot more to them tho than that so keep reading. 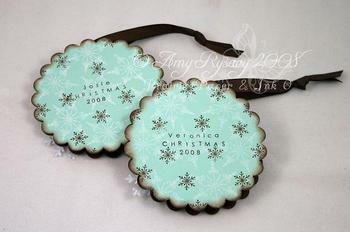 After cutting the coasters (there are 2 coasters per ornament) I cut scalloped circles from PTI's Aqua Mist cardstock. 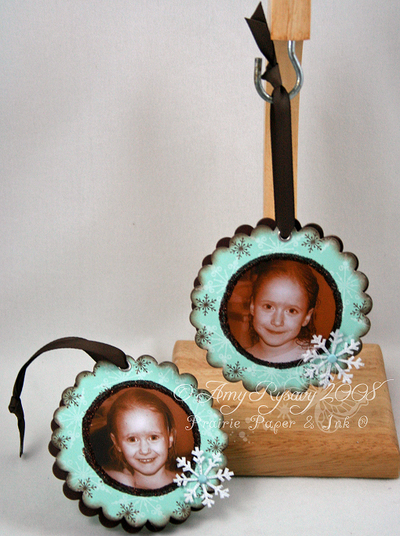 I stamped those with White Pigment ink and Dark Chocolate ink using snowflake stamps from the Snowflake Serenade and Holiday Treats stamp sets, then sponged the edges with Dark Chocolate ink. The pictures of the girls were printed out on my home printer then punched out with a Marvy Circle punch. It's hard to see it in these pics but I added brown glitter as a "frame" around each picture with a glue pen. I attached a Heidi Swapp snowflake (they're clear so I painted them white) with a Bazzill Brad (that matches really well with Aqua Mist) to each ornament, then punched a hole at the top with my Crop-a-dile. I added a large eyelet then used some Dark Chocolate Twill to make the hanger. 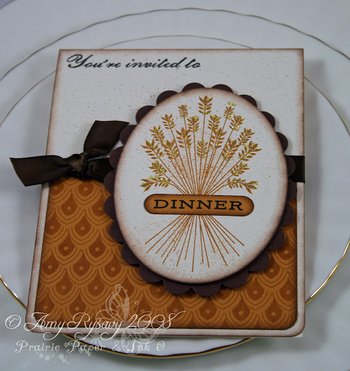 On the opposite side of each coaster I used a scalloped circle cut from Dark Chocolate CS. I then had the girls color me little pictures that I glued to the insides. I made an accordion fold out of a strip of Aqua Mist (using my scor pal), adhered those to the coaters then adhered the girl's pictures (Veronica's is the top one and Josie's is the bottom). I asked the girls to draw Christmas pictures and Veronica drew her and Josie celebrating Christmas this year - out in the snow. Josie scribbled a bit then added purple snow to it (LOL!). Before I had adhered the Dark Chocolate CS I placed Basic Grey Magnetic Snaps on each coaster that hold them together when they're hanging on the tree! As a finishing touch I stamped the girl's names on the back of each ornament along with "Christmas 2008" using PTI's Simple Alphabet. Not only are these quite easy to make (you don't HAVE to use 2 coasters and the accordion fold and whatnot - you could just use one and then on the back include any info or drawings that you like) they would make fabulous gifts for grandparents etc. I plan on making more of these to give as gifts and then make new ones each year. STAMPS: PTI Simple Alphabet, Snowflake Serenade, Holiday Treats. CS: Aqua Mist, Dark Chocolate, White. INK: Dark Chocolate, White Pigment Ink (SU!). ACCESSORIES: 4" Round Lightweight Coasters, Scalloped Circle Nestability Die, Sponge, Dark Chocolate Twill Ribbon, Heidi Swapp Snowflake, Bazzill Brad, White Paint, Large Eyelet, Basic Grey Magnetic Snaps, Art Institute Brown Glitter. Alrighty then - here are the last 2 cards I made using Papertrey's Quilter's Sampler and Quilter's Sampler Sentiments sets. The patterned paper is by Cosmo Cricket - the Hey Sugar line. I stamped the blocks onto various papers then punched them out with my 3/4" square punch (you can find out more info on how I made the cards in my first post HERE). 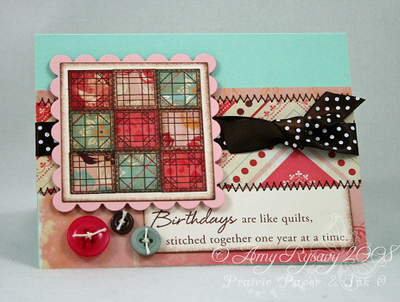 For the first card I used a card base of Aqua Mist cardstock, with the scalloped mat made from Sweet Blush CS. Ribbon is PTI Dark Chocolate Swiss Dot Satin. 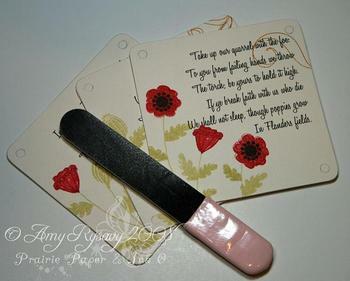 On this second card the base is Sweet Blush CS, a scalloped mat of Dark Chocolate CS, and Sweet Blush Swiss Dot Ribbon. Original post is HERE <---click! Second two cards I made are HERE<---click! Gotta run - hope y'all have a great long weekend! 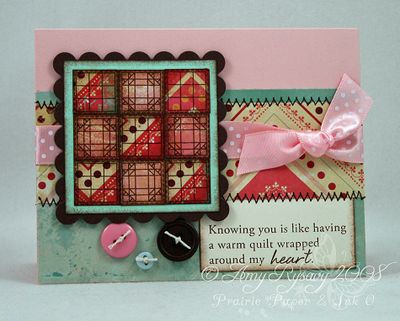 For these two I used a base of PT Sweet Blush cardstock, and cut the scalloped mats from Dark Chocolate CS. Same layouts, with the brown stitching (yup am totally loving the brown stitching - expect to see it a lot in the future!! 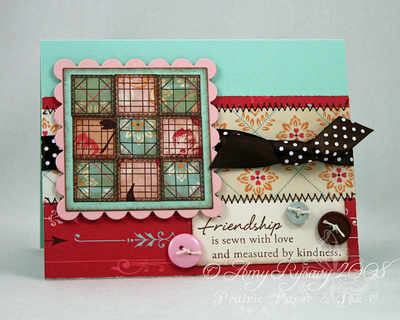 ), yet different sentiments and Sweet Blush Swiss Dot ribbon. I have had this idea to make a bunch of cards using Papertrey's Quilter's Sampler (and the coordinating sentiments set) set along with Cosmo Cricket's Hey Sugar patterned paper pack for some time now. I finally sat down and started on them - it feels SO good to get this idea out "on paper" - and here are the first two I finished. I stamped various quilt blocks onto the patterned papers, punched them out with my 3/4" square punch and sponged them all with Dark Chocolate ink. A set of 9 blocks fits perfectly within a Spellbinders Nestabilities square die - so I diecut several from Vintage Cream and Aqua Mist cardstock. 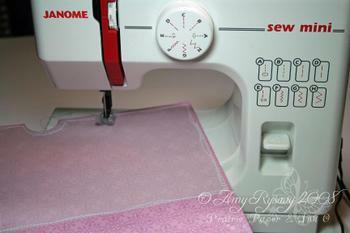 I then cut the scalloped squares from Sweet Blush CS. I also put brown thread into my sewing machine (and am LOVING the look of it - I am thinking I will keep it in there for a while - it's much more noticeable than the white...) and zig zag stitched the edges of the strip of patterned paper. I didn't adhere the sentiments down - just tucked them under the paper before sewing so the stitches hold them in place. I dug through my button jar and found a bunch of buttons that would go well with these cards - attached them with string then added some PT Dark Chocolate Swiss Dot satin ribbon before attaching the "quilt" with dimensionals. I was in the mood to make a birthday card and it had to be a floral one (just in the mood for something flowery I guess!) so I flipped through all my Papertrey stamps and hit upon the Beautiful Blooms set - it's been FOREVER since I've used this set. I already had the Birthday Basics set sitting out - so all I had left to do was decide on the colors and the layout. Colors were easy - I went with Papertrey Pure Poppy, Berry Sorbet, Spring Moss and a base of Sweet Blush. As for the layout I scribbled down a couple of different ideas (I find that it makes cardmaking much more streamlined if I sketch a bit BEFORE instead of fiddling with a bunch of different pieces of cardstock trying to figure out what works...) and hit upon this one and liked it! 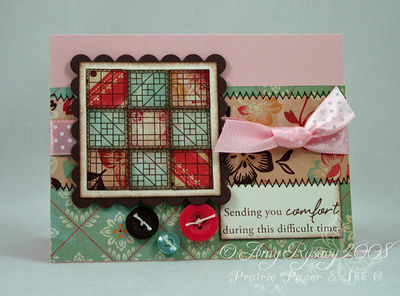 Once I had the stamps, color and layout figured out it took under 20 minutes to put this card together. I punched a Mega circle for the main image, stamped it, then stamped a separate flower and cut it out before adhering it with a dimensional. The sentiment and smaller flower were stamped then punched out with a 1 1/4" circle punch and also adhered with dimensionals. I added a bit of Pure Poppy CS that I used my SU! Scallop punch on and spritzed the card base with red ink. I finished the card off with some Berry Sorbet Stitched Grosgrain (I can't seem to stop using this type of ribbon lately - I reach for it ALL the time) and that was it! 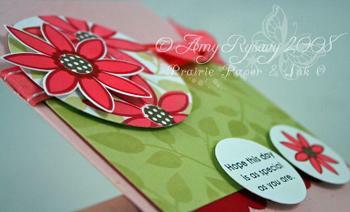 STAMPS: Beautiful Blooms and Birthday Basics by Papertrey Ink. CS: Pure Poppy, Berry Sorbet, Spring Moss, Sweet Blush, Select White. INK: Pure Poppy, Berry Sorbet, Spring Moss, Dark Chocolate. 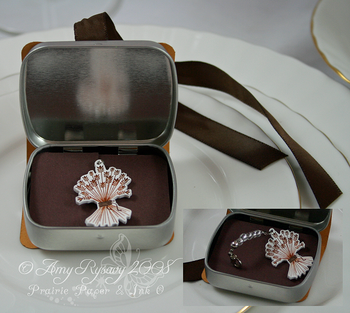 ACCESSORIES: Circle Punched, Scallop Punch, Dimensionals, Berry Sorbet Stitched Ribbon. LOL it took me about 3 days to make this card - no joke!! I only did a bit at a time, and with the heat wave we had (I was told it was around 39C (102F) on Tues - for us that is INSANELY hot) I was finding it hard to motivate myself to do anything let alone stamp! I finally finished this this morning tho and am really pleased with how it turned out! 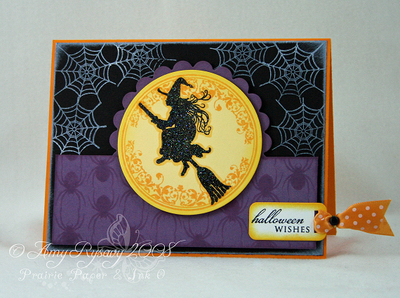 All the images used are from Papertrey's Spooky Sweets II stamp set that was just released. To start off I stamped the large circle label image onto Lemon Tart cardstock with Summer Sunrise ink, then cut it out with a circle Nestabilities die and sponged the edges. 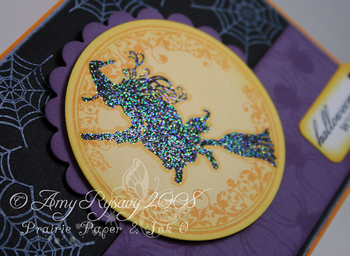 Next I stamped the witch with black pigment ink and embossed her with Iridescent Ice (Stampin' Up!) embossing powder so she's ultra glittery! I also outlined her with a copic marker to give it all a little more definition. I cut a scalloped circle from Plum Pudding CS and stamped another strip of the same with the spider image and Plum Pudding ink. The spider webs were stamped onto black CS with a white pigment ink, the edges sponged with more ink, then I attached it to a card base of Summer Sunrise CS. 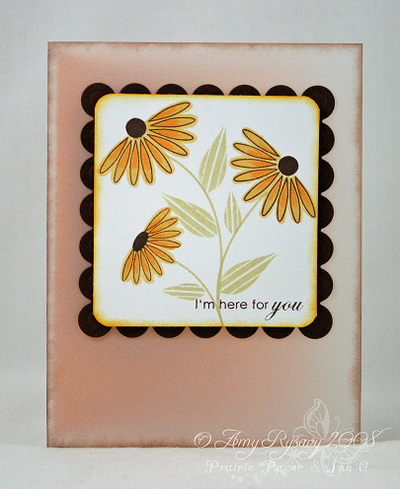 The sentiment was stamped onto a CuttleBug tag (Tiny Tags dies), then I sponged the edges with Summer Sunrise ink and attached some Summer Sunrise Swiss Dot Satin ribbon with a black brad to finish it off. 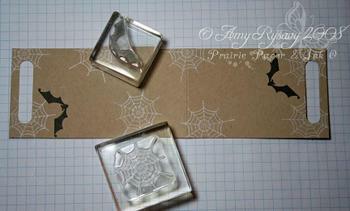 STAMPS: Papertrey Spooky Sweets II. CS: PTI Lemon Tart, Plum Pudding, Summer Sunrise, Stamper's Select White, Black (SU!). INK: Lemon Tart, Summer Sunrise, Plum Pudding, White Pigment, Black Pigment. 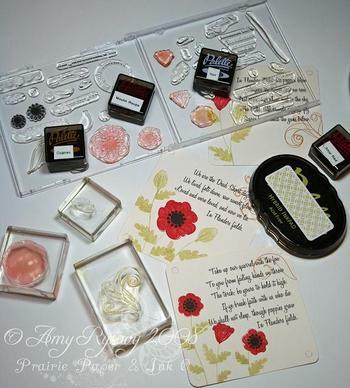 ACCESSORIES: Iridescent Ice Embossing Powder, Dimensionals, Nestabilities Dies, CuttleBug Tiny Tags dies, Summer Sunrise Swiss Dot Satin Ribbon, Black Brad. OK I FINALLY got my card made using the First Fruits stamp set. I had meant to have it done Monday night but we got a massive heat wave here and it's all I can do to just function (and reallyreallyreally wish I had air conditioning!! WAH!!). Anywho I had this layout stuck in my head ever since I made this Rustic Branches card - and no matter what I did I kept coming back to it - so I just went with it. 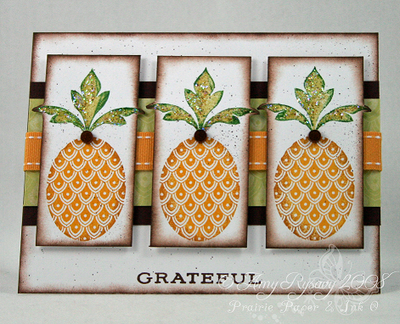 I inked up the pineapple with PTI Summer Sunrise ink, then rolled the edges in Palette Cognac ink before stamping it. I did the same thing with the leafy stem using PTI Spring Moss and Palette Jardin Moss inks. I cut closely with each piece, cutting around the tips of the leaves, then sponged the edges with Dark Chocolate (I am LOVING sponging everything with this color lately - and add to the fact that this type of ink has a real soft look when sponged - oooooohhhh it's SO nice - y'all gotta try it). The Spring Moss strip was stamping with Palette New Canvas ink (not sure if y'all can see it) before wrapping the Summer Sunrise ribbon around it and matting it with the Dark Chocolate CS. I then sponged the card base, stamped the sentiment (something I am really feeling lately - grateful for all the support from you readers, grateful that my dad is still alive (I found out he died 4 times last week altogether and was resuscitated each time - I only knew about 2 of the times) and looks like he will recover fully, grateful for my friends who support me and let me call them to vent when I need to (which is a LOT! ), and many more things I am grateful for that I won't get into right now......) and spritzed everything with chocolate ink. To finish the card off I added Lime Ice Stickles to the leaves, and an espresso Bella Dot from Stamping bella ('nother thing you can't see in the picture - the dot is sparkly in real life). OK that's it for now. It's STILL insanely hot in the house and I am going to go jump in the shower!! 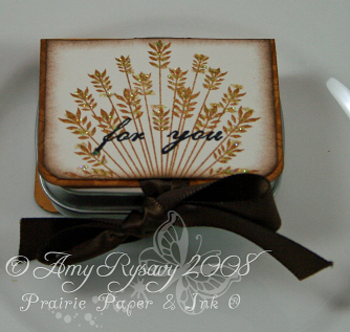 One of our assignments for Papertrey this month was to make a Thanksgiving table setting using the new First Fruits stamp set - as soon as I saw the set I knew I had to use the wheat stamp as my focal point for my set - living in the middle of the Canadian Prairies a stamp like this is a must-have! Once I knew what my main image would be I wanted something to help dress it up - and discovered that the largest plain oval and largest scalloped oval from the Large Oval Nestabilities set was a perfect fit. So I went with that and decided on a color combo of PTI Dark Chocolate and Vintage Cream with SU! More Mustard cardstock and Palette Cognac ink. 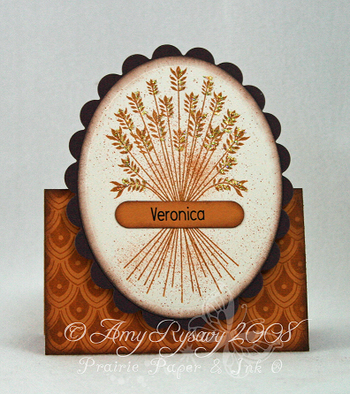 I cut all my ovals and scalloped ovals first, then stamped the images. I used a More Mustard marker and my Color Spritzer to splatter a little color around the wheat and on the Vintage Cream CS. I also added a bit of glitter to the heads of the wheat (Art Institute Honey Suckle glitter) with a glue pen - it's subtle but adds just the right amount of shimmer. 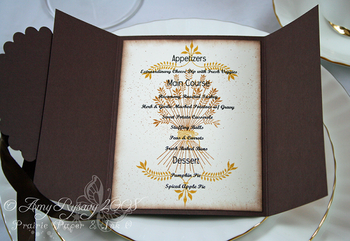 The menu was made as a tri-fold card using my scor-pal - this was the first time I ever used it to make a card like this and if I had known it would literally take 2 seconds (the lines are already marked on it to show you where to score for this type of card) I would have been making a lot more of them before now! I used my Making Memories ribbon slot punch to punch slits on either side of the wheat so that the ribbon slides through and ties in a bow. I cut the ribbon long enough so that it can be untied and slides down to open the menu yet still stays in place enough so that it can be re-tied easily. Here is what the inside of the menu looks like. I made up the menu (listing what my mom is planning to serve for Thanksgiving as I almost always go there the day of!) in my Word program, printed it off onto Vintage Cream CS, trimmed it to fit then stamped the images and sponged the edges before adhering it. I made a little key-chain by stamping the wheat onto white Polyshrink (using Cognac Palette and Dark Chocolate PTI inks), punching a hole at the top then cutting it all out and shrinking it with my embossing gun. I attached wire and a few beads and a clasp to the end then inserted a piece of Dark Chocolate CS into the tin that I cut a notch in to hole the key-chain in place. I used one of the fonts I used for the menu to print off names for the place settings - and sized them so that they could be punched out with SU! 's Word Window punch (honestly I was going to stamp the names with PTI's Simple Alphabet as I thought that would look better but I was too short on time!) and adhered to each image. I made a mini card to adhere the ovals to so that they stand on their own then attached the scalloped ovals with dimensionals. Last but not least are the candles - they are just cheap IKEA candles (I think I paid like a dollar or two for them months ago) but I added the bands to dress them up to match the settings. And the bands slip off easily so that the candles could be burned if someone wanted to (I wouldn't tho! I like them like this). So that's it! I hope y'all liked my Thanksgiving ensemble and don't forget to check out Nichole's blog as she's featuring all of them and linking to everyone else's so there are TONS of fabulous ideas! And a huge thanks to my pal Julie for letting me use her china to take my pics - it was PERFECT for these items (mine is just cheap blue glass dishes from WalMart - not fancy at all). *mwah*!! STAMPS: Papertrey First Fruits stamp set. CS: PTI Vintage Cream and Dark Chocolate, SU! More Mustard. INK: PTI Dark Chocolate, Palette Cognac, Noir and Raw Sienna, SU! More Mustard Marker. ACCESSORIES: Large Oval Nestabilities set, SU! Color Spritzer, PTI Dark Chocolate Satin Ribbon, Sponges, Art Institute Honey Suckle Glitter, White Polyshrink, Wire, Beads, Clasp, PTI Small Hinged Tin, Candles (IKEA), SU! Word Window Punch, Dimensionals, Small Corner Rounder Punch. Change of plans for me - I should be on my way to the city right now to visit my Dad but Josie woke up early this morning throwing up so I've been on puke duty since 6 am. Thankfully she's not REALLY sick (in fact she's playing with her Barbie dolls with Veronica right now) but every time she throws up she freaks out and tries to get away from it.....well let's just say it's been a BIG mess every time......so gross. So anywho I'll be going in TOMORROW to see my dad, and between cleaning duty and doing a ton of laundry I am going to work on my projects for PT's Spooky Sweets II and First Fruits - I should hopefully have them all done by Sunday at the latest. 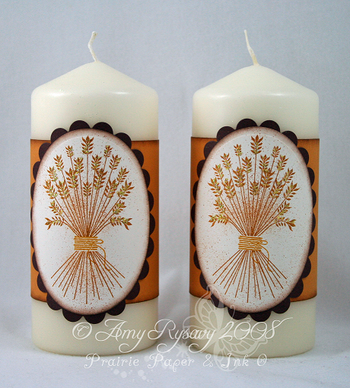 I am loving Rustic Branches - this set is SO Pine! I was totally channeling her as I was making my samples - I felt a real need to use Kraft cardstock and white pigment ink *wink*. I used a pencil crayon to color in the leaves on the card and give them a pop of color. The three panels as well as the Dark Chocolate piece are all up on dimensionals so they all really pop out and "make" the card. (FYI all my supplies are listed in my PTI gallery (which is having issues last night and today!)). For this project I made a little spice jar "wrap" to spice up (no pun intended!) 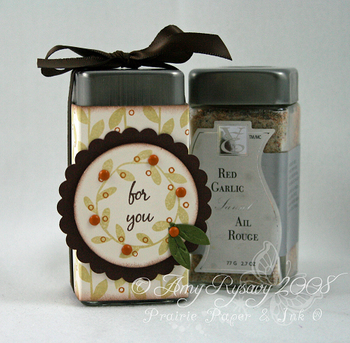 a gift - instead of just the plain jar they are covered in this handstamped wrapper. Once the ribbon is untied the wrapper easily slips off the jar so that the name/ingredients/nutritional value etc can be seen. I stamped the images from the Remember set onto PTI Spring Moss cardstock with black ink. I was going to leave them just black, but then decided to add a little pop of color to the swirly poppy with a red pencil crayon. I added a bit of splatter to the CS with a Stampin' Up! marker and Color Spritzer tool. The twill was attached with double sided tape, and the Pure Poppy flower center was made by attaching 2 punched stars together before piercing the brad (Dollarama) through them and the Primas. For my second project I decided to make a little cover of sorts for one of PTI's small hinged tins. I still have a TON of Stride gum (bought a case of it at Costco months ago) here and I think it makes a great little gift as the gum lasts FOREVER. I discovered that these little tins will hold all but 2 pieces from an entire pack - and look much cuter! I stamped the poppy image several times in a circle (got that idea from Lisa's blog) then colored it in with Copic markers before cutting it out. I took a piece of white CS and scored it down the middle so that it will wrap around the tin - then attached it to the tin with red liner tape (SUPER sticky stuff) before wrapping the Summer Sunrise Swiss Dot ribbon and tying it in a bow (I cut the ribbon long so that it's easy to retie). It's hard to tell but I stamped the top part of the Lemon Tart CS piece with Polka Dot Basics and white pigment ink, then attached the strip of Summer Sunrise CS. 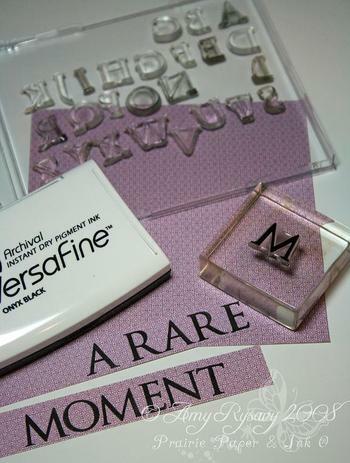 I stamped "Sweet" using black ink and the Simple Alphabet set, rounded the 2 edges with my SU! Small Corner Rounder punch and that was it. Y'all have NO idea how good it felt to create this project - even though I am so stressed out at the moment over what's going on with my Dad (see post below this one) it really helps to just stamp and create and focus on something totally unrelated! 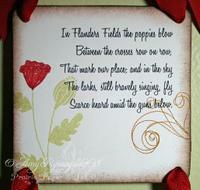 I love the poem "In Flanders Fields" by Lieutenant Colonel John McCrae. When I was in elementary school we recited that poem on every Remembrance Day, and I remember using it for an art piece I drew (and won first place for!) when I was in grade 4 or 5. You can read the full poem along with the story behind it here. So I typed up the poem (using the Honey Script font - one of my favorites) and printed it off onto Papertrey's Vintage Cream cardstock. 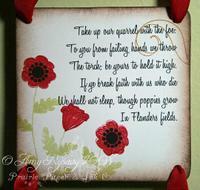 I made sure that each stanza was spaced far enough apart so that they could fit nicely on a 4x4" square. 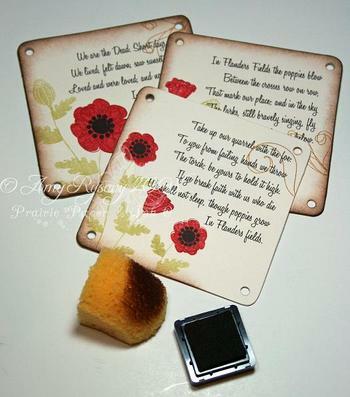 I used lightweight coasters and traced them over the stanza's with a pencil then cut them out. I adhered each piece of cardstock to a coaster using my Tombow Mono Multi, then sanded all the edges with my Basic Grey file (a nail file or a sanding block can do the same thing!) so that they were smooth and even with the coasters. In the picture above you can see where I had marked the holes with a pencil - I used my Crop-a-dile to punch all the holes. To really finish the pieces off I sponged all the edges with PT Dark Chocolate ink. I took a good long length of Pure Poppy Grosgrain ribbon, and starting with the bottom coaster I threaded the ribbon through the holes and attached them all together, tied a bow at the top and hung it on the wall. You can scroll down to the bottom of this post and check out individual shots of each coaster (all the pictures in this post can be clicked on to get a pop-up window with a larger image). I hope you all liked my project and don't forget to check out Lisa's blog for all her sneak peeks with this set!! STAMPS: Remember by Papertrey Ink. INK: PT Spring Moss and Dark Chocolate, Palette Hybrid Moulin Rouge, L'Amour Red, Cognac, Noir. 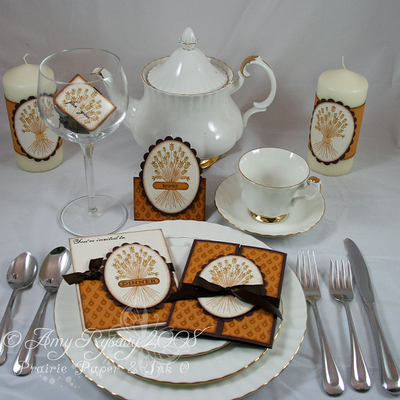 ACCESSORIES: Pure Poppy Grosgrain Ribbon, Lightweight Chipboard Coasters. I don't consider myself to be a scrapbooker - but rather a stamper/cardmaker. However I do dabble with making scrapbook pages here and there (with two little girls it's something I feel like I NEED to do at times! I have to capture the memories somehow!) and lately I have really been enjoying making pages using Papertrey products. The other day I pulled out a few different items (PT Lavender Moon, Plum Pudding and Vintage Cream cardstocks, cardstock vellum, Guidelines stamp set, Trajan Monogram Edition set, Guide Lines 6x6 patterned paper) along with a couple of black and white pictures and set out to make a page. 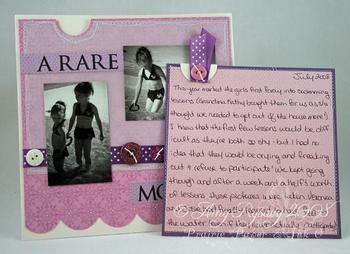 First off - something I have learned to make scrapbooking easier is to use BLACK & WHITE (or sepia toned!) 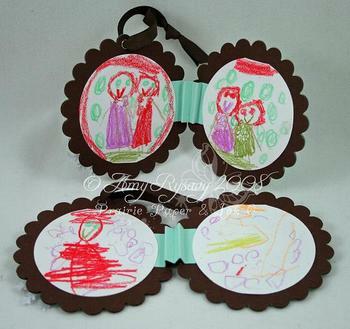 pictures - that way you can use any colors, patterned papers etc that you want and none will clash with the pics! Second - I scrapbook in 8x8" layouts - I really like this size as I don't have to stock a bunch of 12x12 papers plus they're less intimidating to work with than a 12x12 layout. 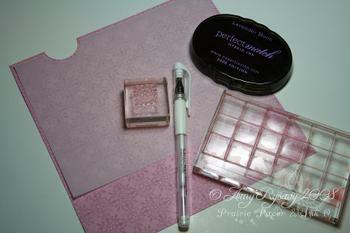 I started off by stamping the Lavender Moon cardstock with the Guidelines stamps using Lavender Moon ink. After that was done I dotted the centers of each image with my white gel pen. The vellum was cut about 1/4" smaller than the Lavender moon CS, and about 2" shorter. I used a 1 3/8" circle punch on the Lavender Moon CS, and a 1 1/4" Circle punch on the vellum (you'll see why I did that in a moment). I used my sewing machine to attach the vellum to the CS, going over it twice and switching the stitches between straight and zig-zag (doing it messy "on purpose" is a LOT easier than trying to keep all the stitches straight!). I stamped my title (using the Trajan Monogram Edition) onto two strips of Guidelines patterned paper (another tip - stamping the title separately then attaching it to the page is a lot easier than stamping directly on the page (and a lot easier to fix if you screw up!)). I then adhered the title and pictures and embellished the cardstock as I wanted. I applied adhesive (red liner tape - SUPER sticky stuff) to the sides and bottom of the page - making sure to leave the top free of any adhesive. So here is the finished page. I added Plum Pudding Swiss Dot Ribbon, and sewed on various buttons with string. I had a lot of journalling to go with these pictures, and I really HATE my handwriting (but I think my girls will appreciate seeing things written by me some day) so I made a separate little page that slips behind the scrapbook page. I used a sheet of the Guidelines patterned paper, drew light lines with a pencil, wrote my "story", then erased the lines. I attached that to a piece of Plum Pudding CS (and it might be hard to see but I stitched around that paper as well), then created a "tab" with a circle of Vintage Cream CS, some ribbon and another button. I hope you all enjoyed this peek into my creative process while scrapbooking and I encourage you to give it a shot if you haven't! Even though I LOVE making cards and whatnot I get a real sense of accomplishment and satisfaction from scrapping a page or two - I may be YEARS behind with all my pages - but I enjoy the process and would rather not stress over where I think I should be with it - and just have FUN!! CS: Vintage Cream, Lavender Moon, Plum Pudding, Cardstock Vellum, Guidelines 6x6 Patterned Paper. INK: Lavender Moon, Versafine Onyx Black. ACCESSORIES: Sewing Machine, Plum Pudding Swiss Dot Ribbon, Buttons, String, Creative Memories Scallop Ruler, Circle Punches, Ranger White Gel Pen. 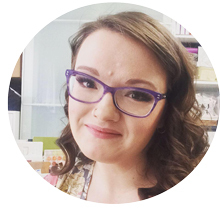 ETA (edited to add): Thank goodness for TypePad's feature of being able to type up and save posts to go live at a later date - hopefully I can get the creative juices flowing over the weekend as a great way (for me anyway) to feel better is to create! The theme for this month's Senior Design Team challenge was Halloween Treat packaging - and to be totally honest I was a little stumped. We don't really celebrate Halloween, but with Veronica starting school this fall and the girls LOVING to dress up (and loving candy is just a given) me thinks it will be a holiday that will be celebrated more and more at my house! This year I thought I'd take a different track from something candy-related - I found these packs of children's playing cards at the local bargain store for cheap - but they're not very "Halloweeny". So I decided to dress them up a bit and then I'll be sending these with Veronica to give to her classmates come Halloween. I created a band out of black cardstock that wraps around the boxes (using my ScorPal to score all the lines - I had to move the CS around a bit to get the lines in the right spots but once I determined where I needed to score each piece I had a stack of the pieces scored in a couple of minutes! 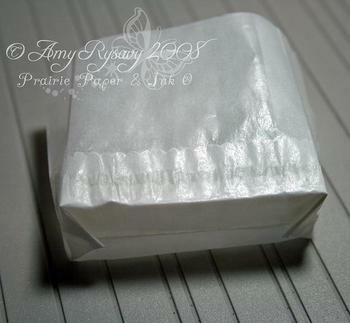 ), then cut a slightly smaller band using Papertrey's Father Knows Best 12x12 paper. I purposely cut the patterned paper in 3" strips so I get 5 strips from each sheet (4 across and one along the bottom of the sheet). 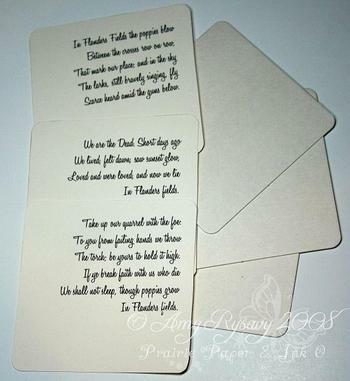 Then to embellish each sleeve I cut ovals with my nestabilities dies out of Papertrey white cardstock, and stamped the raven and "Trick or Tweet" sentiment from the Birds of a Feather set using Summer Sunrise and black inks. To finish off the sleeves instead of adhering the ovals I punched holes in either side, threaded through some Summer Sunrise Satin Ribbon and tied it in a knot - the band then slips off and the box of card games slips from the sleeve. ACCESSORIES: Oval and Scalloped Oval Nestabilities, Hole Punch, Summer Sunrise Satin Ribbon. 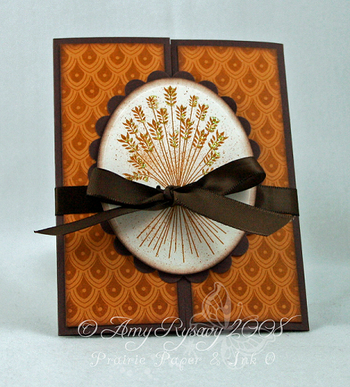 OK here are my last samples for this release - using the new Floral Frenzy stamp set. For this card I stamped the flower heads with Dark Chocolate ink, then colored them in with Copic markers. I stamped the stem and leaves with Spring Moss ink, rounded the edges with a corner rounder punch, then sponged the edges with Summer Sunrise ink. 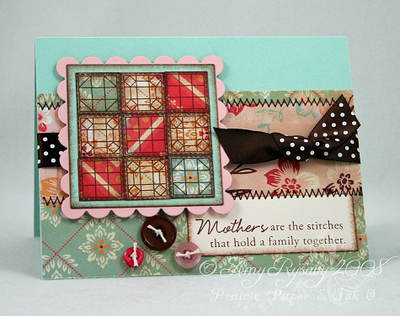 I made the scalloped mat using a Nestabilities die and Dark Chocolate CS. The card base is vellum CS (inked with Dark Chocolate ink) and I attached Summer Sunrise CS to the inside of the card for writing on. 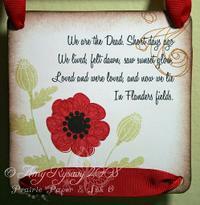 I LOVE the dotted flower center stamps that come in this set - they just have a really cool look to them! After stamping all the flowers (Dark Chocolate, Lemon Tart and Berry Sorbet Ink with Spring Moss centers) I used my SU! color spritzer w/ SU! 's Chocolate Chip marker and spritzed the cardstock. I then rounded the 2 edges and sponged them before attaching the sentiment (the tag was made with the CuttleBug Tiny Tags die) with a bit of Berry Sorbet Satin ribbon attached with a piece of string. I nearly fell off my chair when I saw the Wise Owl and Wise Owl Bellies set by Alli Miles - how CUTE is this set??? 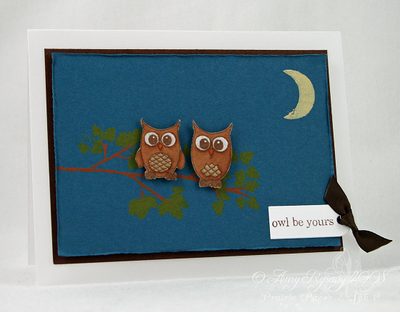 Owls are still really popular in papercrafting right now and this set is like THE must-have owl set!! 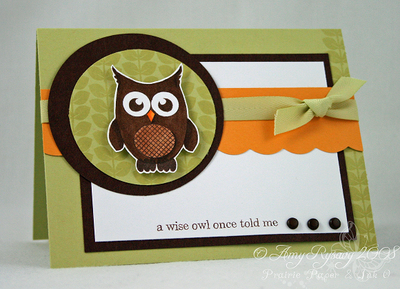 This card is pretty simple - I assembled my owl then colored him in with Copic markers and cut him out. The circles were made with my Marvy Mega and Giga Circle Punches, and the scalloped edge was made with Fiskars cloud scissors. With this card I was trying to simulate a night sky - so I stamped the branch, leaves and moon from PT's Out On a Limb set onto SU! Not Quite Navy CS with Making Memories Scrapbook paints (you can use paint with clear stamps - just make sure you clean them off ASAP!!). The "pre-made" owls from the set were stamped onto PT Kraft CS, colored with Copics then cut out and adhered with dimensionals. The tag was made with a CuttleBug Tiny Tags die. It's hard to tell but the card base is vellum cardstock.